Twenty-five years ago, the Exxon Valdez struck a reef, causing a massive oil spill off Alaska. 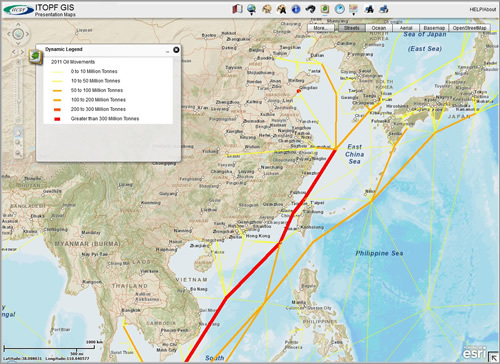 Today oil tanker traffic maps created using ArcGIS inform countries such as China about where oil spills could occur in coastal waters. "Some counties don't know the amount of oil that is going past their coastlines and its potential threat," says Lisa Stevens from the International Tanker Owners Pollution Federation. Read the article. This schematic map from the International Tanker Owners Pollution Federation shows the movement of oil shipments in metric tons off the coasts of Cambodia, Vietnam, China, and Japan. 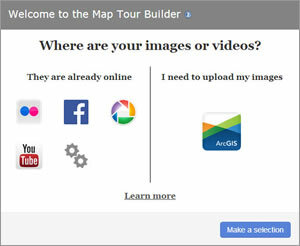 Esri just made making Map Tour story maps a very simple process, thanks to a new streamlined workflow that lets you launch the Map Tour builder directly from the ArcGIS for Storytelling website. Read this tip. As part of the Climate Change Initiative by the White House, Esri will work with 10 cities to develop maps and apps to help these communities better plan for climate change impacts. Read the article. The United States Forest Service uses the ArcGIS for the Forest Inventory and Analysis program, creating reports about the status and trends of the nation's forests. Read the article. You will soon have new GIS capabilities in your hands with ArcGIS Pro for the desktop and Explorer for ArcGIS for mobile devices. Read more about what's coming in ArcGIS this year. Watch Jim McKinney and Thomas Oaks demonstrate ArcGIS Pro, a new ArcGIS for Desktop application that's coming soon. Read this article about why Fairfax County, Virginia, contributed authoritative data to the Community Maps program and how the county benefits. Ismael Chivite from Esri describes the different ways to deploy ArcGIS and the products that do the job. Watch the video. A new app from Esri called Explorer for ArcGIS will help knowledge workers and decision makers discover geographic information and use maps. Read the blog post. A new set of Landsat 8 services released by Esri will provide ArcGIS Online users access to the best and latest images. Read the article. Esri president Jack Dangermond shares his thoughts about "father of GIS" Dr. Roger Tomlinson, who died earlier this year at age 80. Researchers at George Mason University used ArcGIS to analyze which routes were heavily used by tour buses in Washington, DC. Read the article. Using ArcGIS Online, organizations will soon be able to create custom websites to distribute their open data. Read the article. Story maps help you communicate your information by combining maps with text, videos, photos, and other media. This Sharpen Your Skills seminar will help you get started making a story map. With the recent ArcGIS Online update, Esri released Early Adopter templates. The new beta templates will help you turn your map into an awesome configurable app! Read the article. Esri's Derek Law says Portal for ArcGIS serves as a mapcentric content management system and promotes collaboration among staff. Read the article. Mansour Raad explains why using Esri's GIS Tools for Hadoop, an open-source toolkit for tackling big data, makes perfect sense. Listen to the podcast. Check out Esri's new instructor-led developer boot camps and learn how to add interactive maps and analysis capabilities to your mobile apps. Make your ArcGIS workflows faster and easier with these seven easy ways to learn Python and ArcPy. Prepare your data in ArcGIS for Desktop and then learn to create and share a map for data collection. Read the tutorials. No network connection? No problem! Learn to download basemaps or copy them to your iOS or Android device and use Collector for ArcGIS offline. Read the tutorial. Go beyond mapping to use the spatial analysis tools built into ArcGIS Online. Watch the seminar on May 15, 2014. Want to learn how to contribute data to Esri's Community Maps program? Check out the dates and venues for the upcoming Community Maps tour in this blog post. Click on a point on this world map created with Esri technology and get happy with singer Pharrell Williams. Read how a late-night phone call to Esri, answered by company president Jack Dangermond, changed the course of one man's career. Read the article. These 11 case studies show how enterprise GIS lets more people benefit from the power of mapping. Wildfire season in the United States is already heating up. View this Esri wildfire map to see the fire locations and areas where the potential is high for wildfires to spread. View the ArcGIS Online gallery of disaster response web mapping apps. You spoke, casting more than 147,000 votes. Now the new winning Esri International User Conference logo can be unveiled. Read the blog post and visit the Esri UC website to see the new look. Data Appliance for ArcGIS is available to all US customers. It has recently become available for federal government customers to buy through Esri's General Services Administration schedule.